The Water Environment Federation’s Annual Technical Exhibition and Conference (WEFTEC) is the largest water quality event in North America. 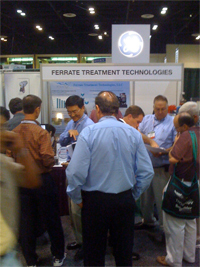 This year’s 4-day event was held at the Orange County Convention Center in Orlando, FL from October 10-14, 2009. Companies in the water technology area showoff their latest products and services to the public. This year had over 900 exhibitors demonstrating to thousands of visitors. WEFTEC also offers the latest in water education and training. FTT definitely made a splash at this year’s event. Even with a small booth, the interest and results lived up to our expectations. At times, traffic stacked up four people deep in front of our booth. We captured 89 pre-qualified leads and received requests from plants and consulting engineers for over 30 treatability and pilot tests.